We are an independent spoken word record label established in 2015. Based between Leeds and London, our aim is to provide vital and accessible spoken word content at the heart of the UK’s thriving scene. As well as digital albums, we produce CDs, vinyl, zines, t-shirts, pin badges, tote bags and limited edition prints. We also produce national spoken word tours and regular #LIVEwire events around the UK. Our social media feeds showcase grassroots spoken word talent from around the world, and our Twitter feed provides news, articles, media content, UK events and more. 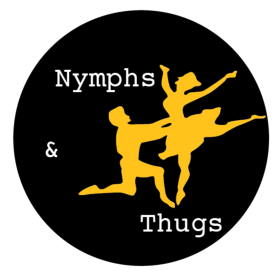 Nymphs & Thugs was formed in spring 2015 by Matt Abbott, after a meeting in Manchester with indie music label Heist Or Hit Records. N&T was initially formed as an imprint on Heist Or Hit. The label became public in the autumn of 2015, with a double release for Louise Fazackerley. Her ‘Bird St.‘ and ‘Love Is A Battlefield‘ albums are now available as part of a 2CD ‘Council House Poetry‘ album. These were followed by Matt Abbott’s ‘Skint & Demoralised‘ album. 2016 saw Toria Garbutt‘s debut album ‘Hot Plastic Moon‘ released after a successful crowd-funding campaign, as well as the quarterly ‘SOAPBOX‘ zine. In the autumn, N&T signed the iconic Salena Godden. Salena Godden’s ‘LIVEwire‘ was released in spring 2017, and was shortlisted for the prestigious Ted Hughes Award. The album came out on 2LP gatefold vinyl, CD and zine, and was supported by a UK tour. A fifth artist was added in spring 2018, with the co-release of ‘Experience Essential‘ by Kevin P. Gilday & The Glasgow Cross, in partnership with Iffy Folk Records. The album is available on vinyl and CD. Autumn saw Matt Abbott release the studio album of his ‘Two Little Ducks‘ show after a 22-date UK theatre tour, and Salena Godden release a ‘Live at Byline Festival EP‘. 2019 sees us add a sixth artist to our label, with poetry powerhouse Luke Wright releasing his ‘Twenty’ album on 2LP gatefold vinyl and download, to mark two decades of performing poetry on stage. The album is out now.